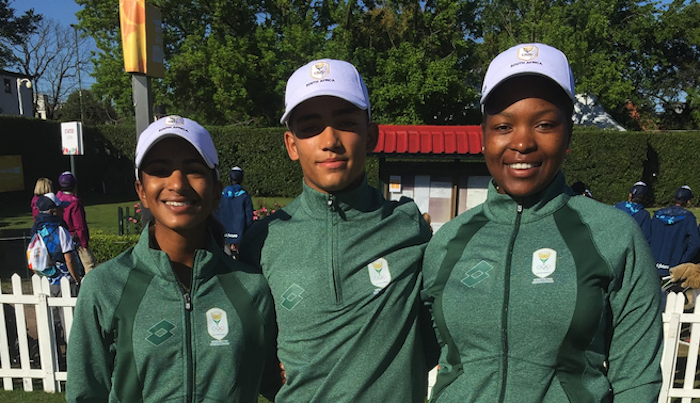 Despite a disappointing week in Buenos Aires, Cole Stevens and Kaiyuree Moodley were excited about the experience gained at the 2018 Youth Olympics. While Australians Karl Vilips and Grace Kim celebrated a golden double in the cold and wet conditions on the last day at Hurlingham Golf Club, the South African duo struggled to the finish line in the boys and girls competitions. After an opening 75 and second round 72, Stevens closed with a 10-over-par 80 to finish 21st on his own on 17-over 227. Moodley followed earlier rounds of 77 and 81 with a final round 76 to grab a share of the five-way tie for 22nd on 234. ‘Kai and I both aimed for top 10 finishes and we both came up short,’ said Stevens. ‘We set our expectations too high and we were both bitterly disappointed, but when we talked it through after the round, we realised that the chance to compete against the best juniors in the world was amazing and the experience outweighed the disappointment one hundred fold. ‘I was excited to start the final round after a much better second round, but the final round was a train wreck. The wind was pumping and my putter was colder than the weather. I started with seven straight pars, but I couldn’t convert any of my birdie chances. ‘I hit my driver right at the 8th and my 2nd into the bush, so I had to take an unplayable and turned two over after a double. I dropped shots at 10th and 11th, and had another double at 14th. More bogeys at 15th and 17th and another double at 16th when I hit my driver out of bounds. ‘It definitely wasn’t the final round I hoped for, but I learned a lot. You can’t compete at this level without an A-game, and I wasn’t at my best. I battled with chipping and putting and on the final day, I let myself down with the driver. ‘On the positive side, it was fantastic to play against top juniors and a golf course that is so different from anything we play at home. The course is incredibly tight and the greens are really small and play hard and fast. It was a challenge to try and figure out how to score on the course. We both look forward to the team competition to try to put into practice what we learned this week,’ said Stevens. Moodley was equally inspired after playing the back nine on the last day in level par. ‘I was six over through the first 11 holes, but I made six straight pars and finished with a birdie,’ said the 17-year-old Bryanston golfer. ‘The highlight of this week was the birdies I made at the 7th in round one, the 2nd in round two and the last hole in the final round. Moodley said the experience gained was priceless. ‘We went up against juniors that are the best players in their countries and we both got a good idea where we stand. In a way, it was a wake-up call. We were both outside our comfort zone on this golf course and it was challenging to learn and compete at the same time. World No 56 Vilips claimed a two-shot victory in the boys competition on four-under 206 with rounds of 69, 68 and 69, while compatriot Kim carded rounds of 71, 69 and 71 to win the girls competition by three strokes on one-over 211. Thirty-two nations will compete in the 54-hole team competition from 13-15 October. The format will be fourball strokeplay in round one, foursome strokeplay in round two and cumulative team play in the final round.